BTS were ROBBED @ at the Grammys. Why? It’s not, “Remember Me” from “Coco” was nominated for Song for a Visual Media, it’s doesnt mean that Benjamin Bratt is a Grammy nominee. Celine Dion has sang on two Oscar winning songs, she doesn’t have any Oscars herself because she didn’t write them. BTS don’t have any Grammy nominations for designing their album package because they didn’t design the album package. It’s not that hard to understand. Don’t worry sis ITZY’ll avenge them next year! because how are we meant to judge their music when we dont understand what theyre singing? people barely understand western, English-speaking music nowadays. stop the racismé. not everyone in America understands English either, let’s just cancel The Grammys altogether? Stay mad at GRAMMY NOMINATED group BTS' success, they are here to stay! "The Grammy Award for Best Recording Package is one of a series of Grammy Awards presented for the visual look of an album. unless the performer is also the art director." Why is a damn package even a Grammy award? 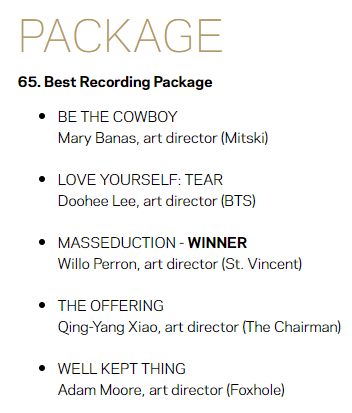 I'm surprised they were nominated for anything at all tbh ... let alone "Best Recording Package" (which doesn't even go to them sksksks). You should be thankful their irrelevant payola'd asses were even noticed in the firsr place..
K-Pop is garbage. This is like asking why One Direction never won a grammy.